We’d love your help. Let us know what’s wrong with this preview of The Empty Space by Peter Brook. As relevant as when it was first published in 1968, groundbreaking director and cofounder of the Royal Shakespeare Company Peter Brook draws on a life in love with the stage to explore From director and cofounder of the Royal Shakespeare Company Peter Brook, The Empty Space is a timeless analysis of theatre from the most influential stage director of the twentieth century. As relevant as when it was first published in 1968, groundbreaking director and cofounder of the Royal Shakespeare Company Peter Brook draws on a life in love with the stage to explore the issues facing a theatrical performance—of any scale. He describes important developments in theatre from the last century, as well as smaller scale events, from productions by Stanislavsky to the rise of Method Acting, from Brecht’s revolutionary alienation technique to the free form happenings of the 1960s, and from the different styles of such great Shakespearean actors as John Gielgud and Paul Scofield to a joyous impromptu performance in the burnt-out shell of the Hamburg Opera just after the war. 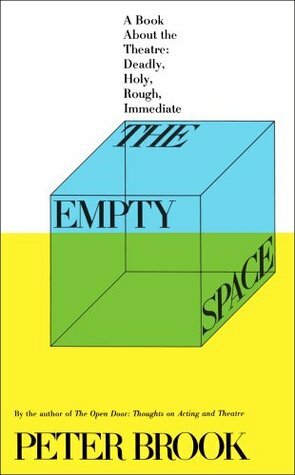 To ask other readers questions about The Empty Space, please sign up. This was suggested reading for my acting class and I was told it would probably be too deep for our standards but I actually really enjoyed it and got a lot from it. I must read for any fellow drama nerd. 1. It's a book about the current state of theater, written in 1968. As I was born in 1984, the author has literally no knowledge of any performance I have ever seen in my life, nor have I seen any of the performances he describes. So it's hard to relate his opinions about the state of theater to today, not knowing if I agree with his assessment of 1968. 2. The book is inscrutable and high-minded to a fault. I can't decide if I agree with him if I can't understand what the hell he's saying. I am abandoning this. Nothing to do with the book or Brook's erudition, though - I am stuck in a reading slump and this is not the ideal book for revival. Having seen Brook's televised "The Tragedy of Hamlet," and his filmed version of "King Lear," not to mention, the idea of his most recent "Love is My Sin," I take his word for what it is: clear thoughts from one perspective of what the theater could be, how it should be, and what is should not be. Brook separates theater into four slices: Deadly, Holy, Rough, and Immediate. In doing so, he opens up possibilities for the Dramatist and gives us a solid grounding in the more metaphysical aspects of Having seen Brook's televised "The Tragedy of Hamlet," and his filmed version of "King Lear," not to mention, the idea of his most recent "Love is My Sin," I take his word for what it is: clear thoughts from one perspective of what the theater could be, how it should be, and what is should not be. Brook separates theater into four slices: Deadly, Holy, Rough, and Immediate. In doing so, he opens up possibilities for the Dramatist and gives us a solid grounding in the more metaphysical aspects of the theater. He shows us how these modes overlap and divide, gives numerous examples, and spills his thoughts on the page as a master to a student. I am most interested in Brook's interpretations of Shakespeare and this book expostulates on the possibilities of what a Shakespearean play could be or how it could be staged, or how it so often, to the chagrin of Brook, falls into the realm of Deadly Theater (gaudy, costumes, overly heightened, etc.) and how to move away from that. Taking Brook on his own terms and then reading Shakespeare will transform your understanding of Shakespeare, at least it did to me. If anyone knows of any other great imaginers of the Bard, please do let me know. Many people can easily go through life reading nothing but novels. I admit that is better than not reading at all, of course, but it wouldn’t do for me. While the novel is still my favourite genre, I always need to mix it with other reading matter: history, travel, short stories, graphic novels, essays, drama. I don’t think I’ve ever read a collection of essays on theater before, though. The empty space is apparently an essential text for drama students; I’d never heard of it. Its idea is simple, Many people can easily go through life reading nothing but novels. I admit that is better than not reading at all, of course, but it wouldn’t do for me. While the novel is still my favourite genre, I always need to mix it with other reading matter: history, travel, short stories, graphic novels, essays, drama. I don’t think I’ve ever read a collection of essays on theater before, though. I like my theater like I like my men: deadly, rough, holy, and immediate. What I found most interesting was Brook's examination of the role of the audience/spectator in theatre and how a "good house" can empower and participate with performers while a "bad house" can spoil a performance. While much of the book is more advice for actors and directors from the performance side, the parts which spoke to the connection between performers and audience members helped me to imagine what can be socially constructed between both groups within and during a live performance. A concise yet erudite opinion of the theatrical condition, albeit in the 60s. A funny provocative dated sociological text on theatre that has spawned a billion student essays. I think I read this chap-book manifesto 25 years ago. I know it was talked about a great deal by teachers of drama who got their degrees/ diplomas in the 1970s. It is very much a sales spiel, and, the author admits to making up 'successful productions' that didn't actually happen, when he first started directing theatre. It's on this basis, you've got to regard Peter Brook's enthusiasm and social acti A funny provocative dated sociological text on theatre that has spawned a billion student essays. It is very much a sales spiel, and, the author admits to making up 'successful productions' that didn't actually happen, when he first started directing theatre. It's on this basis, you've got to regard Peter Brook's enthusiasm and social activism, as spin, and his text, has to be regarded as rather blatantly misogynist, in its male-focused momentum. p33 relays, 'Outstanding actors, like all real artists, have some mysterious psychic chemistry, half conscious and yet three-quarters hidden, that they themselves may only define as "instinct", "hunch", "voices", that enable them to develop their vision and their art'. This is refreshing to hear, as at least the author is not psychiatrist, recognising such things as 'voices' as a necessary part of artistry. All too often theatre is sprinkled with psychiatrisms, which in many ways are far worse than misogyny. I liked the first and last chapters but found the middle rather dry. There were some interesting tidbits here and there throughout, but a lot of it was just stuff I've heard before. -When he moved the cardboard cutouts around to plan out his show and then found that the actors were completely different. I've done that! -The show where all the actors got to costume themsel I liked the first and last chapters but found the middle rather dry. There were some interesting tidbits here and there throughout, but a lot of it was just stuff I've heard before. Read as course work for Helen Mirren’s Master Class on acting. Peter Brook, director of the Royal Shakespeare Company and several operas at The Metropolitan Opera, gives us a tour of the role of theater, past and present. Theater presides as the main character with Brook expounding on its various aspects and its importance in our culture. For actors, theater goers, and all interested in the arts. Nobody who ever has or ever will stride upon a stage should be ignorant of this book. It is as essential to you as your next breath. British theater and film director Peter Brook (still living though retired) is primarily known as an influential Shakespearean, though he has plenty of other credits. "Hamlet threw Ophelia on to the knees of the audience, while he swung above their heads on a rope" sounds like the kind of thing tha British theater and film director Peter Brook (still living though retired) is primarily known as an influential Shakespearean, though he has plenty of other credits. "Hamlet threw Ophelia on to the knees of the audience, while he swung above their heads on a rope" sounds like the kind of thing that invites ridicule. The "deadly" is everything from an unimaginatively presented Shakespeare or even "Ubu Roi" to the most cliched Broadway hit. The "holy" generally supposes a spiritual or psychically transcendent unity of audience and performers - Artaud and The Happenings movement of the 60s are included and there are specific discussions of Merce Cunningham, Beckett and Grotowski, people whose work, 40 years later, is in many ways unequalled. The book is a record of Brook's lecture about 4 forms of theatre; the Deadly, Holy, Rough, and Immediate Theatre, which he defined based on its impact to audience. The Empty Stage starts off interesting. It definitely made me appreciate the many abstract concepts that actors need to consider and continuously shape in doing their art. However I found Brook's ideas growingly hard to follow because he tends to use big hazy words and metaphors. Most sentences and paragraph are long, and he jumps from The book is a record of Brook's lecture about 4 forms of theatre; the Deadly, Holy, Rough, and Immediate Theatre, which he defined based on its impact to audience. The Empty Stage starts off interesting. It definitely made me appreciate the many abstract concepts that actors need to consider and continuously shape in doing their art. However I found Brook's ideas growingly hard to follow because he tends to use big hazy words and metaphors. Most sentences and paragraph are long, and he jumps from one ideas to another without clear transition. Like he can comment on actor, playscript writer, and theater critic in one lengthy paragraph. After awhile I have to keep reading back and forth to keep track of his points. The Empty Space seems as important a study in theatre today as it did so many years ago when I first read it. In his chapter on Immediate Theatre, Brook says of his his own writing: "As I continue to work, each experience will make these conclusions inconclusive again. It is impossible to assess the function of a book—but I hope this one may perhaps be of use somewhere, to someone else wrestling with his own problems in relation to another time and place." As true as this might be, this work rea The Empty Space seems as important a study in theatre today as it did so many years ago when I first read it. In his chapter on Immediate Theatre, Brook says of his his own writing: "As I continue to work, each experience will make these conclusions inconclusive again. It is impossible to assess the function of a book—but I hope this one may perhaps be of use somewhere, to someone else wrestling with his own problems in relation to another time and place." As true as this might be, this work really needs to be freshly consumed or wholly revisited by anyone interested in the relationship between actor and audience. Very dense at times. Asks a lot of open ended philosophical questions. I don’t think I’ve ever had a book make me think this deeply. Theatre is living and breathing. It is never ACTUALLY within definition. Brooks offers four possible definitions. A pure theatre unattainable. We must attempt to be as pure as possible while understanding that “pure” is both without definition and defined by all - actor, audience, playwright, society (both current and timed). Brooks says it best at the end: Even as he Very dense at times. Asks a lot of open ended philosophical questions. One of the issues with a lot of writing about theatre is that can be abstract. Even spiritual to a degree. Spiritual in the sense that pseudo points are made through bonkers metaphor. Although this writing at times does fall into this trap. And has a tendency to sound sphinx like. It has some value in it. Esp. the first chapter which is still a major problem where I am in Canada. And important read for theatrical artists.... esoteric for others. I feel like this is one of those "Emperor's New Clothes" books. There are some really intriguing ideas but overall, I found it full of waffle and negativity. As a collection of speeches, essays and conversation that has been crafted into a book, I felt it lacked structure. It seems awfully dated too for the modern reader. That said, I did really enjoy the last chapter so I am glad I forced my way through as it contained many thoughts that I hadn't considered. One of the seminal books on theatre by master theatre director Peter Brooke. I first read this in the 1970s and have re-read several times. A must read for any serious theatre or acting student. Brooke's work makes you realise how artistically impoverished most modern theatre and television productions are. This was a wonderful read. In many ways, I find it represents a middle ground that I've been looking for in my personal journeys in theatre - it grapples with the contradictions inherent in theatrical work, and I think it does an adequate job providing potential answers to those questions. Altogether an engaging look at what makes theatre good, bad, and indifferent. So much to ponder and consider from rereading this after studying it in college. The final chapter and the questions of immediate theater and its worth resound deeply, even/especially today. Competition is no longer just the cinema but all the online media too. Peter Brook (born 1925) was a world renowned theater director, staging innovative productions of the works of famous playwrights. Peter Brook was born in London in 1925, the son of immigrant scientists from Russia. A precocious child with a distaste for formal education but a love of learning, Brook performed his own four-hour version of Shakespeare's Hamlet at the age of seven. After spending two Peter Brook (born 1925) was a world renowned theater director, staging innovative productions of the works of famous playwrights. Peter Brook was born in London in 1925, the son of immigrant scientists from Russia. A precocious child with a distaste for formal education but a love of learning, Brook performed his own four-hour version of Shakespeare's Hamlet at the age of seven. After spending two years in Switzerland recovering from a glandular infection, Brook became one of the youngest undergraduates at Oxford University. At the same time he wrote scripts for television commercials and introduced to London audiences his first professional stage production, Marlowe's Dr. Faustus. Brook, called the "golden boy," did his first production at Stratford Theatre, one of the world's most prestigious stages, at the young age of 21. It was Shakespeare's Loves Labours Lost. He spent the next several years staging acclaimed productions of plays. He worked at the Covent Garden directing opera, as well as designing the sets and costumes for his productions. Always seeking innovations and styles which would make his productions speak to modern audiences, he ended this experience with opera by calling it "deadlytheater." He directed plays with prominent actors, including Laurence Olivier in Titus Andronicus and Paul Schofield in King Lear. (Brook also directed the film version of this production.) In 1961 Peter Brook directed one of his seven films, the chilling Peter Shaffer adaptation of Lord of the Flies. Despite his successes and the fact that he was named as one of the directors of the famous Royal Shakespeare Company in 1962, Brook continued to seek out alternative ways to create vibrant, meaningfultheater. This search led him to direct a season of experimental theater with the Royal Shakespeare Company in which he was free from the commercial constraints of box office concerns. The season was called "Theatre of Cruelty," a name taken from the works of Antonin Artaud, one of this century's most influentialtheater men. Brook's desire was to turn away from stars and to create an ensemble of actors who improvised during a long rehearsal period in a search of the meaning of "holytheater." Out of this search would come the director's finest work. In 1964 Brook directed Genet's The Screens and Peter Weiss' Marat Sade, for which he received seven major awards and introduced Glenda Jackson to the theater. Influenced by Bertolt Brecht and Artaud, Marat Sade shocked the audience with its insane asylum environment. In 1966 he developed US, a play about the Vietnam experience and the horrors of war. The production reflected a collective statement by all of the artists involved and was certainly a departure from traditional theater. Jerzy Grotowski, one of the most important theater directors of this century and a man who profoundly influenced Brook, came to work with the company during this production. Brook also did an adaptation of Seneca's Oedipus by Ted Hughes, a renowned English poet who continued to collaborate with the director for many years. The culmination of this phase of Brook's work was hisproduction of A Midsummer Night's Dream (1970). Using trapezes, juggling, and circus effects, Brook and his actors created a sense of magic, joy, and celebration in this interpretation of Shakespeare's play. It was a masterpiece of thetheater.